I'm not a huge fan of the typical daily sentence edit or language practice exercise. Often, they are just too scattered for my tastes. I remember when I dutifully tried to use them in my first years of teaching. "Why are we doing this?" my seventh graders asked, way back in the late nineties. "To practice editing," I answered. But then we would move from the daily practice to our actual writing of the day--and the kids would plunge right into making the same kinds of mistakes that they had just corrected in the exercise at the start of class. Something wasn't connecting. #4 is really important to me. I love being in a content-rich, inquiring environment. And that is one of the reasons that I don't really like a lot of the existing daily edit activities--they are so disconnected and so contrived. So I set myself the tall task of making sentence imitating and combining activities that also teach handwriting, review parts of speech, and (most importantly) aren't awful. Today we started out with a presentation about sentence imitation. I created this to be highly scaffolded. Can you tell that I'm also trying to teach prepositional phrases at the same time? To build context and interest, I have YouTube playlists to go along with our main topics: tide pools and frogs. ...and it worked! Beautifully! The kids wrote lots of different sentences with prepositional phrases. As I walked around, I encouraged kids to show me the subjects, verbs, and prepositions in their sentences. Here is what the daily sheet looks like. Notice that it has special handwriting lines with a dashed midline. This has really been helpful for my early-year fourth graders who are still working on smaller handwriting. The next question, of course, will be to see whether this carries over into writing. The Daily Sentence Lessons have an end-of-week paragraph in each set. This week's paragraph asks students to write about their day--a task that I know will prompt them to use prepositional phrases. I'm hoping for the best! These last two weeks have been so much fun in science! I have to admit that I like it as much as the kids. I love how scientific experimentation naturally leads to reading and writing. Here are some snapshots of our lessons. Last year I was lucky enough to have an empty classroom across the hall. How amazing! We could go over there and make as much of a mess as we wanted and then leave for the rest of the day. Now I have a fantastic colleague across the hall instead. So I needed to come up with a way to squeeze in room for science in my own classroom. In late August I snagged a rectangular table that was sitting in the hallway labeled "Please take." (Don't you love the late August giveaways just before school begins?) I set up this table next to the sink in my room and covered it with a reasonably attractive vinyl tablecloth. The science table! This was spur of the moment decorating choice, but it has influenced my decisions in planning for science. Just having a table dedicated to science really leads to better activities. You must have trays. Plastic trays like the kind at the mall food court. Trays are so amazingly useful--they can hold materials, sort items, quickly set up to share things at student tables and across classrooms. If you have a limited science budget, you will not regret buying trays. How many should you buy? I have 10 and still run out sometimes! This is the best part. After we learned about the scientific method, students had a scaffolded experiment planning page. We brainstormed testable questions that they could ask for the materials that I had available. Then, they created a materials list and wrote out procedures. Many students struggled a bit with writing procedures. We talked about how each step needed to have a verb--something that you do. I showed students where to find the word "Observe" in the classroom after seeing it misspelled in the beautiful variety of transitional spellers. Everyone, even my reluctant writers, made sure to finish writing their procedures. 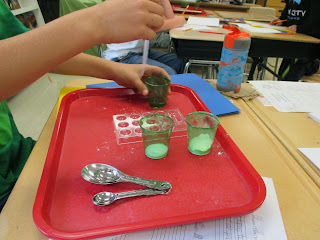 To keep things simple, I told students that they had a limit of three items for their experiment. On the experiment day, I set students up with finishing their other writing tasks (we are doing the daily sentence writing--it's working fabulously!) while I called students over to the science table to get their materials. One student paid two coupons for the privilege of being the science assistant for the morning. So at any one time I had about 8 experiments going at different places around the room. They were all very simple things, mostly along the lines of mixing baking soda with various liquids to observe what would happen. But the kids were thrilled with the experience. "This is such a good day!" one girl gushed. As things were winding down, the students were moving on to other writing, helping with the clean-up, or going on to their own self-selected tasks. 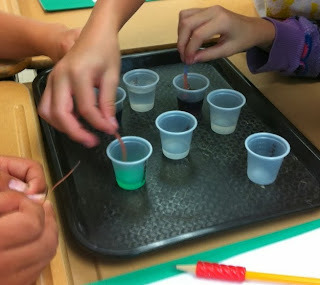 Many of the students had gotten science experiment books at library on the previous day, and a few sat down to try to create new experiments or read about other things they could try. -Limit materials. It is so much easier (and cheaper) when you don't have too many items going around. -Use small, 2 oz. cups. These help students to conserve materials. -Try to buy some inexpensive disposable droppers. They are available in science supply catalogs and they make the whole process so easy. The observation corner is a part of the science table. Since the start of school, I have set out random things for students to observe and experience. (Week 1: cartesian divers; Week 2: color paddles and prisms; Week 3: animal skins and butterfly wings; Week 4: sandbox) Fourth graders still need experiences with rich materials and interesting items! 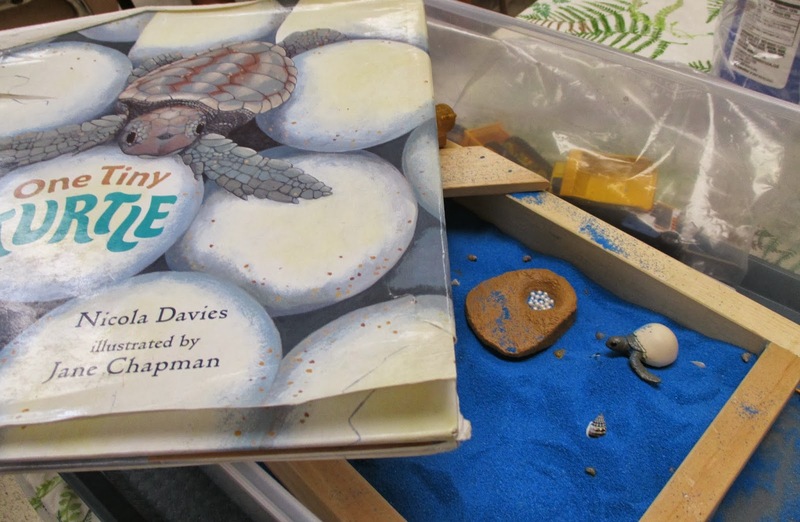 This week's observation corner is a small sandbox filled with blue sand. I have a set representing the different parts of a turtle's life cycle to go along with One Tiny Turtle. It's been interesting to watch how the students interact with the different materials. Only three students may be at the observation corner at one time, and students have been doing nicely at asking for permission and using the materials wisely. These kinds of activities lead to so much purposeful talking and sharing with the students. It has been a great start to the year! I am so excited that Frolyc is finally up and running for everyone! Here is a little bit of background. As many of you know, I get lots of emails from people that I don't know. Often it is just a quick back-and-forth, but I have also had longer correspondences with a number of great teachers over the years. Last winter, Niru emailed me to ask some questions about expository text. We started chatting and she told me about Frolyc--an app that allows teachers to publish text and questions to the iPad. Writing content for Frolyc has been fun. I get to write text and add photos and video links. Kids can answer multiple choice questions, use drag and drop graphic organizers, and complete word searches. It is so neat to see how readers interact with this new kind of text. In my classroom, I have used Frolyc as an incentive for kids during independent reading, a tool to build background for science units, and a way for students to build their skills with multimedia texts. Lexile levels are provided for the texts, so you can be sure that you are giving students an appropriate challenge. So here's how it will work. On the computer, you can set up your Frolyc account and create your classroom. You can author your own activities or choose some of what has already been created. (You'll see some favorites from the text structure units, as well as plenty of new texts!) Then, put the Frolyc app on the iPads. Kids can select their name from the list and then use the activities that were assigned to them. Right now it's free! And you can get double free if you sign up. 1. Sign up to try Frolyc. 2. Leave a comment on this blog post about your experience. Was there something that was confusing? Interesting? Something else you'd like to see? Email me at elkissn@yahoo.com with your comment. Clicking and Clunking into the New School Year! Well...I have now had my class for seven school days. What a huge change! Now I have matched names with faces and faces with handwriting. I know who likes to run errands, who loves our class catfish, and who takes the initiative to take a poll to name our fish. I feel much more settled. Last time, I wrote about starting the year with clicks and clunks. It really worked out pretty well. What I like about the terminology is that it doesn't take much explaining--kids already know what the words mean. There are many different books to model clicks and clunks. Over in third grade, my husband used Earthlets: As Explained by Professor Xargle to great effect. Some kids totally clunked the first time he read the story aloud--they just didn't realize that "Earthlets" are babies. After they talked about it and the kids adjusted their mental models, he reread the book. There was much more laughter the second time around as the kids turned their clunks into clicks. I have two reading classes, both in the afternoon, and I like to change up the books to keep things interesting for myself. I used the document camera to share The Goldilocks Variations by Allan Ahlberg with the first class. Right away we had a clunk on the first page: What does the word cheeky mean? In this case, I explained the meaning of the word, and the students quickly understood. The word cheeky is used repeatedly through the story. (And it is such a great word!) 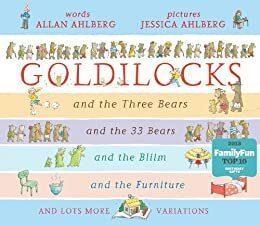 When we got to "Goldilocks and the Bliim", we really had the opportunity to discuss using context to solve words. And the author helpfully provides an English-Bliim picture glossary. With my next class, I went right into the first chapter of Toys Go Out. I love this book so much for transitional readers! We had a great discussion about what they were visualizing. We also talked about how sometimes authors give us clunks on purpose. It's so tricky as a reader to figure out when we have to fix up a clunk right away, and when we can just relax and read on. Chapter Two is even better for visualizing--what is Plastic?--and will be a treat for next week. I extended the thinking about clicks and clunks into independent reading. This year I have tried to move kids faster from the easy, fun books and into books that will take them several days or weeks to read. It's not always successful. I had them use the page "Keeping Track of Clicks and Clunks" to think about what they were understanding. What if a reader has no clunks? Then that book is too easy! (Or they're playing the Pretend Game.) This conversation is so important, but we just had the chance to get started with it before the end of the week. I knew that it was working when a student brought up a science paper to me and said, "This part just clunks," pointing to a sentence. So he was able to find where he was having a problem and point it out...a first step to success! Then at the end of the day we finished up with a game of Streets and Alleys outside over the hill. (It is so lovely to teach at a school that has space "over the hill"! It just sounds fun and exciting to say.) If you are not familiar with the game, you really should try it with your students: here are directions. The directions say it is a small space game, but we spread out quite a bit. -It's not too late for the September reading homework--they don't actually say "September", so you can use them into the fall. I am working working working on an October set. -I'm about to pull out my Max Mission stories for another year. These are short texts that give kids practice in making text-based inferences. -We're trying out using Daily Sentence exercises in writing class this year. Based on the work of Don and Jenny Killgallon, these exercises will (hopefully) help students to become more aware of how sentences are put together. Edit: These are now available here and here.